Franz Josef Glacier is a Jewel among New Zealand's Glaciers! The Beauty of Franz Josef Glacier is Marvellous! While Hinehukatere was in love, she cried of pain and her tears created Franz Josef glacier, the mythology says. The Alpine glacier in the western coast of New Zealand, where the ice and rainforest meet, is one of the beautiful sites in the world. The following article is about this beautiful site in the world. If you know more information about this beautiful place in the world, please use the form at the bottom of the page to share your thoughts. Thanks. 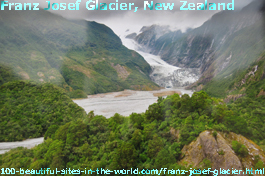 Franz Josef Glacier is widely considered to be the jewel among the glaciers in the western coast of New Zealand. The reason why it is so unique is that it descends from almost 3,500 metres above sea level and continues down to only 240 metres above sea level. Thus, the glacier terminates at the lowest altitude. Called also the world's Alpine glacier, the glacier ends closest to the sea surface, in the middle of a temperate rainforest that makes the area a very beautiful site in the world. In addition, the ice melts into Wiaho River, which continues into the Tasmania Pacific. The glacier was named after Emperor Franz Josef 1 of Austria in 1865, but its more poetic Maori name is Ka Roimata o Hinehukatere, meaning "The Tears of Hinehukatere", deriving from a local legend about a girl whose lover dies in an avalanche. Her tears flowed down the mountainside, freezing and forming the glacier. Like some other glaciers Franz Josef has its own cycle of retreating and advancing, which is independent of climate change. After withdrawal of several kilometres between the 1940s and 1980s, Franz Josef Glacier started advance again in 1984. In the long term it is shrinking, however, as are all of the glaciers in the New Zealand Alps. Globally, the combined mass of mountain glaciers and snow cover has been declining consistently in both the northern and southern hemispheres. Between 1991 and 2004, the speed at which the glaciers of the world have been shrinking has accelerated, contributing 0.8 millimetres per annum to the rise in sea level. The glaciers in the Alps of New Zealand have been shrinking since 2000. On average, the glaciers in the Southern Alps have already been 38% shorter and have lost 25% of their area. According to glaciologists from New Zealand's Canterbury and Victoria universities, the Franz Josef Glacier could disappear within the next 100 years. By the end of the century, Hinehukaere may well have cried her last tear. Have you been in Franz Josef Glacier or any beautiful place in New Zealand? Do you know more information about New Zealand? Please share any information you know about those beautiful sites in New Zealand through the following form. Thank you. If you found this page about Franz Josef Glacier, the Alpine glacier in the western coast of New Zealand useful, please share it with your services through the buttons below, or at the left column of the page or at the bottom of the page. If you do not have a service there, register for one free service and enjoy this kind of technology and social networking experiences. Thank you. "Solo Build It" at the bottom bar empowers this page about Franz Josef Glacier, the Alpine glacier in the western coast of New Zealand and the entire website.